With September upon us school is back in full swing! School schedules are all new to me with this being Alex's first year, starting kindergarten. Dustin and I are so excited to start this new phase in our parenting! Watching the enthusiasim of a 4 year old learn his letter sounds and count to 100 is priceless! 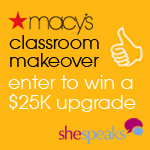 I'm so saddened to see so many of our schools cutting back due to the economy, but I was really encouraged when I heard that Shespeaks has teamed up with Macy's and their $25K Classroom Makeover Sweepstakes. ...So what are you waiting for?? It only takes a few seconds to enter, it's totally worth it!! Disclosure: This blog post is part of the SheSpeaks and Macy’s Classroom Makeover Sweepstakes Campaign. I am being compensated for my time. As always, all thoughts and oppinions are my own.